Healthcare providers and insurers are aware that emerging markets remain crucial to their long-term prospects. In a bid to consolidate their position in key emerging markets, such as China and India, leading healthcare providers and pharma companies are opening up new facilities and partnering with local players. Spending on healthcare services is expected to grow at a higher pace in Asia Pacific, owing to the rise of a strong middle class. We anticipated key players to increase their investment in emerging markets in the future. Persistence Market Research collects data from secondary sources including company annual reports, association publications, industry presentations, white papers, and company press releases. Apart from these we leverage over paid database subscriptions and industry magazines to collect market information and developments in exhaustive manner. After being done with desk research, detailed questionnaire and discussion guide is formulated to initiate primary research with key industry personnel; the discussion aims at collecting key insights, growth perspectives, prevalent market trends and quantitative insights including market size and competition developments. Both of these research approaches help us in arriving at base year numbers and market hypothesis. The number of cases of dengue are growing rapidly during the past few years. Major regions of the world that are affected by dengue are Africa, the Americas, the Eastern Mediterranean, Southeast Asia and the Western Pacific. As per the numbers provided by WHO, the number of reported cases is continuously increasing. Americas reported more than 2.38 million cases of dengue, in which Brazil alone contributed 1.5 million cases, which is approximately three times higher than those reported in 2014. The Western Pacific region reported more than 375,000 suspected cases of dengue in 2016, of which the Philippines reported 176,411 cases and Malaysia reported 100,028 cases. A rising prevalence of dengue virus has raised the demand for diagnostic kits, which is expected to drive the dengue testing market in the near future. There have been recent outbreaks of dengue, chikungunya and West Nile virus in countries that were previously free from such kind of diseases. This signals some of the potential threats with respect to change in climate and global warming. Changes in climate have increased the current and future risk in countries of the European region. Due to a change in the climate of European countries, there has been a great impact on the vector distribution and potential disease transmission. High rainfall increases the number of breeding sites, whereas humidity influences the lifespan of mosquitos. Also, curtailed water supply and disrupted sanitation services lead to conditions that facilitate mosquito breeding and proliferation, while warm temperatures lead to longer active season for mosquitos. Change in climate is likely to increase the burden of dengue fever, and this in turn will propel the growth of the market of dengue testing. Presently, the diagnostic test kits that are available for testing dengue are less effective. Due to the unavailability of effective diagnostic tools and high price of existing test kits, a need has been created for cost effective test kits with high specificity and sensitivity. As a result, companies operating in the market are currently focusing on the development of cost-effective and reliable test methods for dengue testing. In addition, increasing research and development activities to develop highly specific and sensitive diagnostic kits is also expected to create new growth opportunities for the manufacturers of dengue test kits. The major focus of the manufacturers is to develop point-of-care tests, which are rapid, sensitive and easy to use. Presently, a large number of methods for the detection of dengue virus are still dependent on cell culture and mice inoculation and such type of methods are slow and costly. Hence, there is a strong need of developing rapid, easy to use and sensitive methods for detection of dengue. 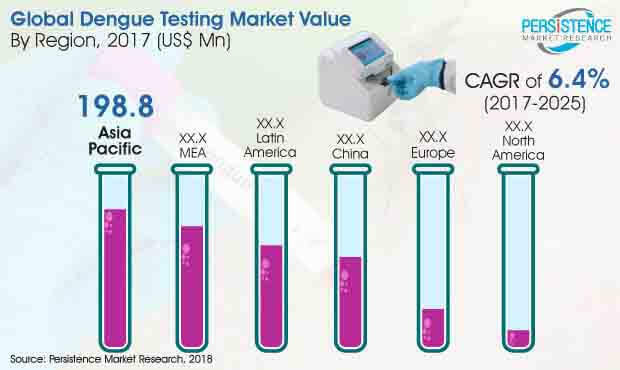 The global dengue testing market was dominated by Asia Pacific region in revenue terms in 2017 and this trend is expected to sustain itself throughout the forecast period. Asia Pacific is projected to be the most attractive dengue testing market. Asia Pacific dengue testing market accounted for 44.1 percent share in 2016 and this share is going to reach 43.6 percent by 2025 end.